Pictured above is a vessel I handmade. The shape and construction is reminiscent of small vessels or boxes made with Christmas/Birthday cards. The sections/walls were then crocheted or Buttonhole Hand stitched together. This was very popular mid last century. With my vessel I did not use pre-printed pictures but hand drew my own designs on each wall. Each wall has two Korus (fern fronds). 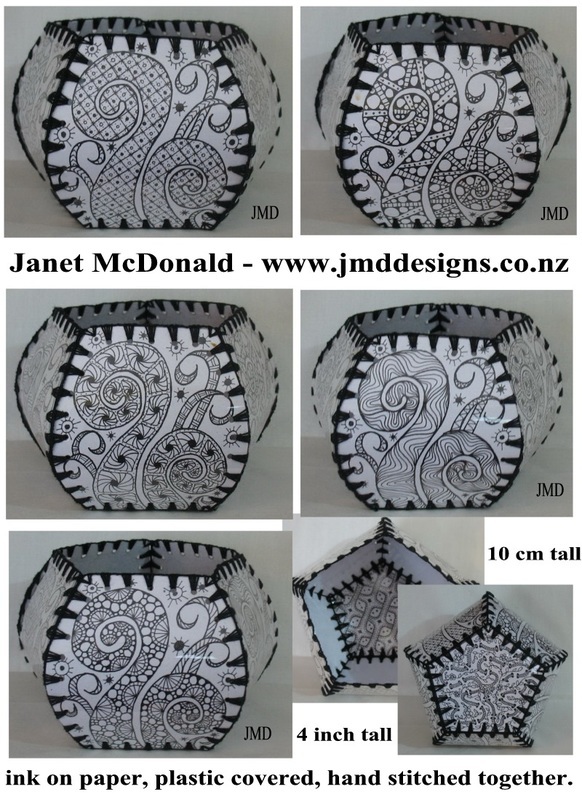 Inside each Koru I have used a different drawing filling similar to zentangles using ink. 2. Draw your wall/base shape onto the paper and draw your design inside those lines. 3. Cut out your paper wall/base shapes, making sure all are the same size to line up together eventually. 4. Lay the paper shapes between two layers of plastic. You can use clear plastic sheets used for the front of spiral binded presentation folders. The plastic should have a crisp flexible feel to it. 5. Use a paper clips to hold all three layers together and cut out your shapes. 6. Use a paper clips to hold all three layers together and then make holes around the edge of your shapes and regular intervals. 7. Now crochet or Buttonhole stitch your shape edges together.